This weekend, join AALDEF attorneys at three immigration events in New Jersey and New York, with presentations, free legal advice clinics, and discussions about recent immigration developments. AALDEF attorneys are staffing free immigration legal advice clinics at the Christ United Methodist Church, 2811 John F. Kennedy Blvd, Jersey City, NJ. This event is organized in partnership with Migrante NJ and the Community Outreach and Migrant Integration Ministry Inc.
Sunday, March 26, 12 noon-1:30 pm: Immigration Clinic – Woodside, NYAALDEF is co-sponsoring an immigration clinic organized by the South Asian Bar Association of New York’s Pro Bono Clearinghouse at Adhikaar, 71-7 Woodside Ave., Woodside, NY. For more information, go to the Facebook event page. 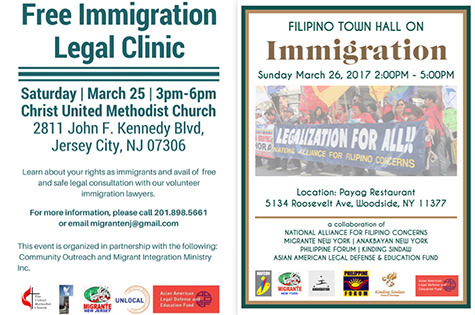 AALDEF attorneys are participating at a Filipino Town Hall on Immigration at the Payag Restaurant, 5134 Roosevelt Ave., Woodside, NY. Co-sponsors include the National Alliance for Filipino Concerns, Migrante New York, Anakbayan New York, Philippine Forum, and Kinding Sindaw. Get information about your legal rights in light of recent executive orders on immigration, ICE raids, and other recent events.